Gordon Ramsay, the embattled TV chef and restaurateur, has nearly $1 million in tax liens against him, RadarOnline.com has learned exclusively. According to court documents we uncovered, there are two outstanding New York State tax warrants against Ramsay. The latest one was filed last month and is for a whopping $419,051. Back in July, another warrant was filed for $513,003. That’s $932,054 if you want an exact count, as we’re sure Ramsay’s creditors do. Chef Ramsay’s company suffered financial setbacks in the last two years as the recession hit his rapidly expanding restaurant empire and he fired his CEO father-in-law in a bitter family feud. 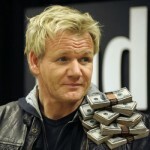 Ramsay sold his flagship New York Restaurant, The Gordon Ramsay at The London, but remains a consultant. The very popular TV chef, famous for his hot tempered personality, earned 12 Michelin stars for his many restaurants and was one of only three chefs in the UK to have three Michelin stars at one time.